Where is Bob? : WXYZ Twitter & Facebook: The Way to Do Business ...Go BIGGBY! 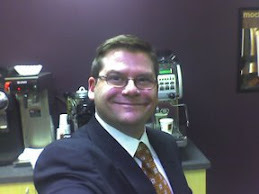 WXYZ Twitter & Facebook: The Way to Do Business ...Go BIGGBY! NOVI, Mich. (WXYZ) - Long before the first Biggby bean is ground, before the first drip drops, before Risa adds the first swirl of whipped cream, Bob Fish is patrolling his far-flung coffee empire like some virtual barista from the keyboard of his computer. Fish is founder and CEO of Biggby Coffee, a Michigan-based chain with 115 stores nationwide, but on Twitter and Facebook he’s better known as “Biggby Bob” (@biggbybob). He is a constant presence on the social networking sites. If there is a single comment, criticism or complaint Bob will most likely respond within minutes. It goes back to when Bob opened his first shop fifteen years ago and actually worked behind the counter handing customers their drinks, talking to them about what they liked and didn’t like. “What social media has done for me is allowed me to lean over that counter and continue that conversation, but with 115 stores,” says Fish. Judging by the comments on Twitter Biggby Bob’s one-on-one touch, even from a distance, has created a loyal customer base. It's the BIGGBY way, leaning over the counter and talking to our customers! But the really cool thing is that while doing this we LISTEN! Love it Bob, great interview. It was a great interview--I also liked how they made the initial shots of you in the piece as if they were tailing you, piecing together furtive shots from across the lobby, over your shoulder, through the window, and then "in the flesh." Nice effect, and a good piece. Thanks for posting it! Ugh. Just an awful limerick. I do enjoy the story of how BIGGBY COFFEE takes care of things that are by no fault of the stores. The woman who spilled their drink and was sent a new one. That is awesome and perfect customer service!! I really enjoyed this piece. As someone who essentially grew up hanging out in Michigan coffee shops, the social media element makes perfect sense. 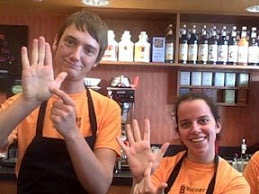 Biggby really went about this in the right way - making customer service a top priority, in the store, online, anywhere.